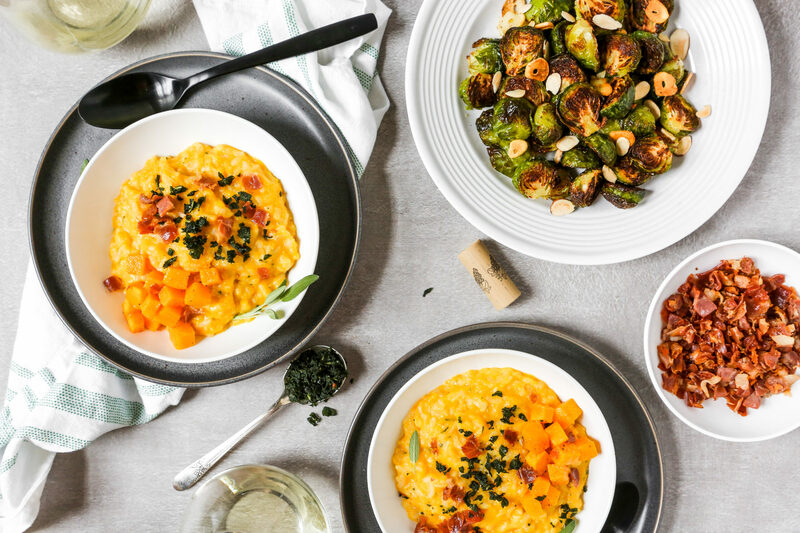 Risotto week continues with this delicious fall dinner menu featuring a creamy Butternut Squash Risotto and a super easy (and so delicious) Brussles sprout side dish. It’s hard to pinpoint who the star of the show is for this fall dinner menu. 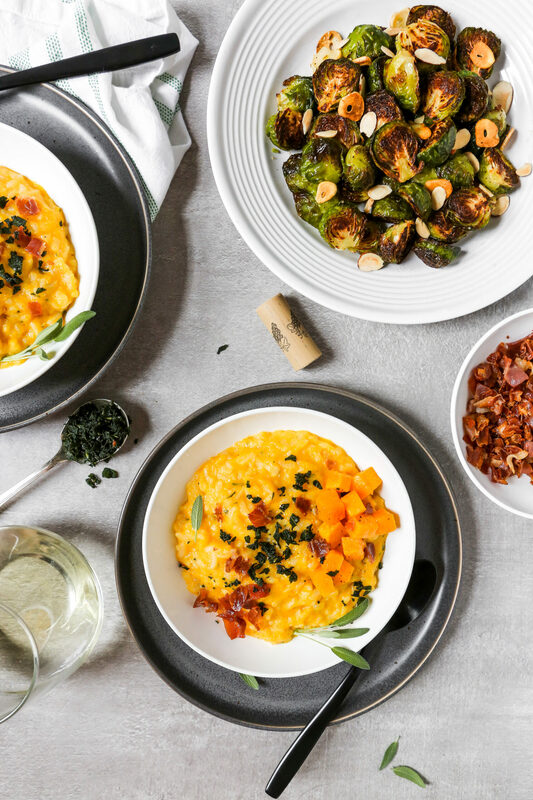 My initial instincts tell me the stunning, and oh-so creamy Butternut Squash Risotto. But why? Is it because it’s traditionally a time-intensive dish? Or does its vibrant orange hue just scream showstopper? I can’t say why, but it does evoke a sense of royalty for sure. But a creamy risotto, even the most wholesome as can be, requires some kind of veggie side dish. And in keeping with the season, these perfectly roasted Brussels sprouts just can’t be ignored. They’re tender, garlicky, and most importantly, easy as hell to throw together. This side dish is a cinch to make and will absolutely astound you with how flavorful it is. Whether you plan to make this menu or not, keep this Brussels sprouts recipe handy— they’re a wonderful addition to any holiday menu. How many does this menu serve? This menu is best fit for 6 people, but can easily be multiplied to serve more. Can anything be made ahead? Go ahead and get the squash roasted ahead of time. You could even purée it (according to the recipe instructions) up to 2 days in advance to cut down on dishes and cooking the day of. Other than that, I would make it all the day of—it comes together faster than you think! The recipes featured in this menu will be posted over the next few days, so keep an eye out!